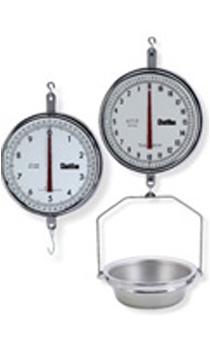 The 8200 Series mechanical hanging scales are crafted of chrome-plates steel with machines stainless steel pinions and a phosphor bronze rack combination for virtually frictionless performance. The 13-inch double dial reaches full capacity in three revolutions. Runners are indexed for each revolution. Brass air dashpots eliminate pointer oscillation. The 8200 Series may be specifed as a Class lll "Legal for Trade" scale. Available in avoirdupois and metric models, the 8200 Series can be supplied witha bottom hook (nickel plated steel) or the popular AS circular pan. The AS Pan is constructed of stainless steel. The supporting ring and bow are of nickel plated steel. The removable 5-inch deep round pan has drain holes and is USDA approved for use in general food handling.